Praslin, the second largest island in the Seychelles group, and just 7 miles by 2, is only a fifteen minute flight by 18-seater 'Twin Otter' aircraft from Mahé. Alternatively, it is one hour by sea on the 'Cat Cocos' ferry - an air conditioned catamaran, with up to three return crossings a day. Praslin Island is somewhat quieter, and less developed than Mahé, but as well as an exotic paradise of dense vegetation and lush coconut groves, boasts an excellent and wide-ranging choice of Praslin Island hotels . Almost 100 years ago, General Gordon (of Khartoum) visited Praslin and became convinced he had found the original Garden of Eden. He developed this theory when he saw the strange shape of the infamous 'Coco de Mer'. This enormous coconut is shaped like a female pelvis, which he then identified with Eve. These nut only grow naturally on the giant palm trees in the Vallée de Mai National Park. They can be seen on the nature trails through the forest, along with the insect-eating pitcher plant, vanilla orchids, as well as rare birds - the Seychelles bulbul, fruit pigeon and the black parrot, many indigenous to Praslin. 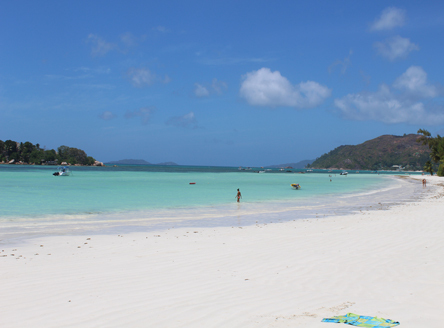 Praslin Island in the Seychelles is famous for its white sandy beaches. Two to mention are Anse Lazio, frequently voted one of the world's best beaches, and also the fabulous Cote d'Or beach. Most beaches offer safe bathing and excellent snorkelling among the living corals, which are home to an amazing nine hundred species of fish. One can either hire a bicycle, a taxi, go on an organised trip round the island, or hire a car for a day or two. Praslin has Seychelles' only 18-hole Championship Golf course at Constance Lemuria hotel. It's also an excellent base for day-trips to other islands such as La Digue, Cousin, Curieuse and St. Pierre. These beautiful islands are inhabited by thousands of birds and turtles, and their waters possess beautiful coral reefs - perfects for snorkelling.